When Alzheimer's strikes there is a tendency to give up, or you can decide something very different - to live life to the fullest extent possible. Once I accepted the harsh reality that my mother was living with Alzheimer's I made a simple straightforward decision -- Dotty and I would live our lives as we always had. Don't get me wrong, I understood there would be constraints which included Dotty's age, and the effects of Alzheimer's disease on the brain. To be honest, I decided to ignore both to the degree possible. Now for the many of you who are new to the Alzheimer's Reading Room this might sound a bit outlandish, or maybe impossible; however, we did do it, wrote about it here for years, and we even have video and podcasts. We lived our life. Lived it in fact until the last 20 days of Dotty's life. Dotty went to Heaven when she was 95 years old. This is a picture of Dotty at the Banana Boat in Boynton Beach, Florida. This is one of the places we would go to weekly to hang out. See all those people around Dotty. Notice she is not all bent out of shape? Not nervous or telling me she wants to go home. 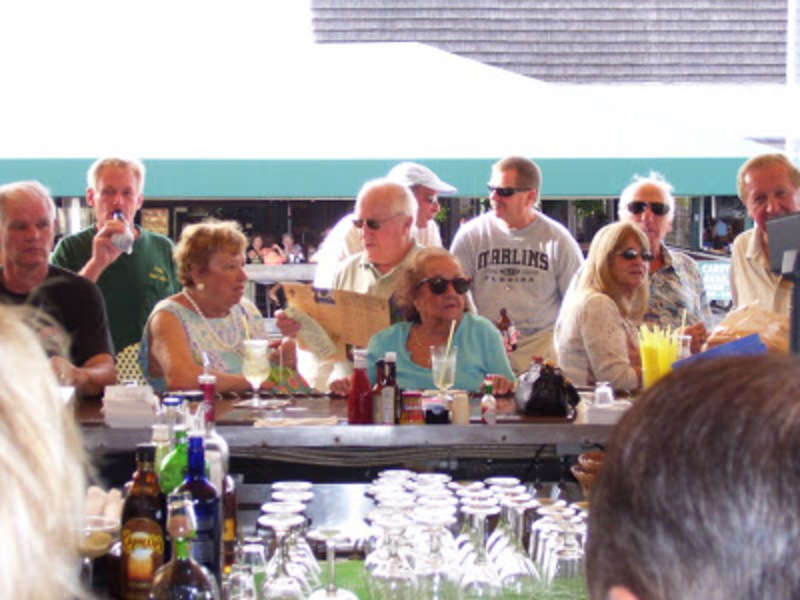 Many people that live with Alzheimer's don't like crowded places or being around a lot of people they don't know. I can tell you that Dotty was a little nervous when we first started going to the Boat. I had to learn to sit her in the right place when we first started going to a new place. In the case of the boat, we sat very near where you see her in the picture every time. Establishing a routine does help in a big way. Just so you know, in the picture Dotty's was 93 years old and that was her birthday party. Dotty was diagnosed more than 6 years earlier, and scored a 14 on the MMSE earlier that year. The 14 means she was well into the moderate to severe stage of Alzheimer's. Here are some excerpts from an article I wrote years ago on this issue -- Dotty and I Live Our Life as We Always Had -- You Can Do it Too. I strongly suggest that you take the time to read the article in full. I see my mother in the way I always have.....Dotty is the same person I have known for my entire life.....We are continuing to live our life in the fullest way possible.....While there are times that somehow seem horrific, there are times that are also wonderful.....Quite frankly, Dotty never stops amazing me.....I learned one of the most simple lessons of them all.....Dotty is capable of doing more, much more, then I imagined during those two horrific years when I was a novice Alzheimer's caregiver. The decision was both simple and complex. The easy part -- Dotty and I would start living our life. The hard part, coming to the understanding that there needed to be more then just Dotty and me...I had to find a way to put Dotty in situations that were cognitively, socially, and communicatively stimulating...The Banana Boat was the first answer. Bright light, lots of friendly people, and you can eat with your hands. It worked better then I could have ever imagined. You can live your life after a diagnosis of Alzheimer's. You start by doing the things your loved one did in the same exact order they did them before the diagnosis. Then, you build on that routine until it becomes a pattern of living and pattern of behavior. 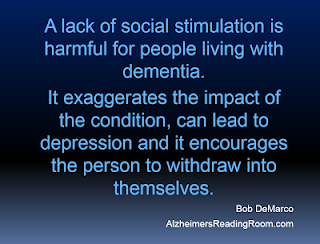 Original content the Alzheimer's Reading Room. We Educate and Empower caregivers and their families. 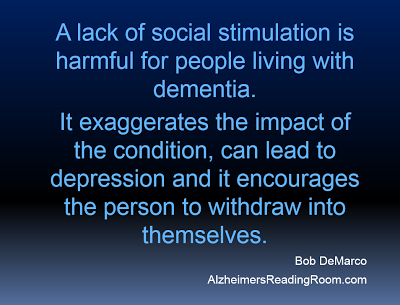 The Alzheimer's Reading Room operates for the benefit of society.